Just steps away from the thriving Patong beach and Andaman Sea, Holiday Inn Resort Phuket, is a great place to stay during a tropical vacation in Southern Thailand. It is settled in lush tropical environment. The popular Patong beach is just across the road. 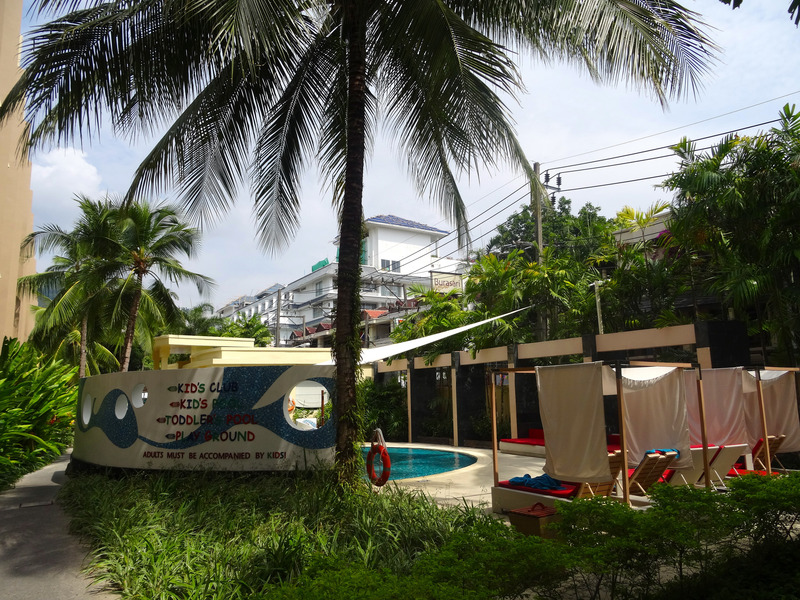 The Holiday Inn hotel is closer to the the south end of the Patong beach. 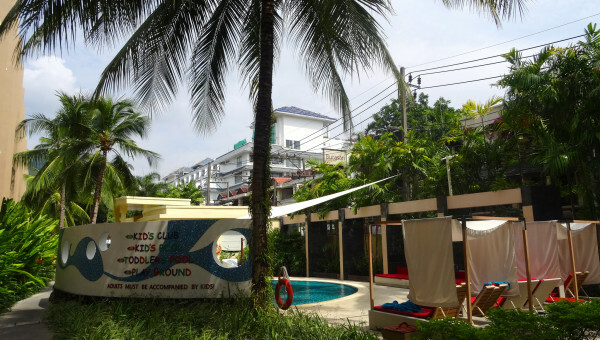 The resort is within a walking distance to Bangla Road, the Jungeceylon shopping mall and the night bazaar. It takes 10 minutes to get from the resort to the heart of the night life in Patong. If you follow the left side of the promenade you will soon reach an authentic fisherman village located on a riverside bank. Longtail boats for daily excursions to pristine beaches around Phuket are parked just in front of the resort. The most impressive thing during our stay at Holiday Inn Phuket was the unique atmosphere combining typical Thai décor and modern amenities. The architecture and design were a beautiful interpretation of Thai building style. In general, guests can opt between several types of accommodation separated in two wings. Each of room designs is different, combining in its style high-end facilities and stylish decoration. The main building features contemporary design. It hosts spacious rooms and colourful suites suitable for families with children. Family suites provide lots of space. Bathrooms are equipped with showers only. Probably the most amazing thing is the VIP treatment to the kids. There are child’s rooms connected to the adults’premises. The accommodation has an ensuite bathroom. Studios can be decorated in either a Sailor or Ocean World theme. The themed fun space is designed especially for kids. Rooms are furnished with beds shaped like ship, fish and other funny members of the marine life. The colour scheme and layout vary depending on guest’s choice. Family suites can accommodate a maximum of two adults and two children under the age of 12. Kids’room delight with amenities that can include an Xbox 360, toy box, TV, DVD player, special desk and themed wardrobe. The bright rooms offer modern living space, decorated in marine nuances. The in-room entertainment includes a TV, DVD player, and complimentary WiFi. A glass wall separates the bedroom from the bathroom. There is an ample storage space. Among the amenities are safe, tea and coffee maker; fridge; hairdryer; large terrace with sun beds and pool views. There is another wing with Thai styled studios. It is a good choice for people looking for a romantic atmosphere and an exceptional experience. On the second floor of this wing are located the Superior rooms which are furnished with bathtub; TV, DVD player, safe, iron; tea- and coffee-making facilities,bathrobes; slippers and hairdryer. Most of the rooms have pool view. The wooden blinds ensure privacy and nice sleep. This part of the hotel is designed to delight couples and single travelers. The traditional Busakorn studios are elegantly styled. The balconies are overlooking tranquil tropical gardens. The wing has a pool area with sun-loungers reserved exclusively for the use of villas’guests. Holiday makers benefit from the vicinity of fountains, Jacuzzi and bar. 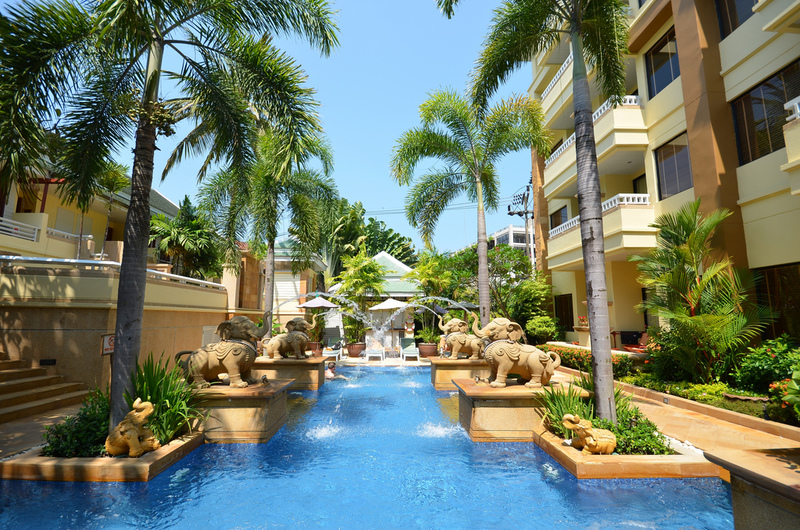 So, guests can enjoy the calm ambiance and privacy in the heart of vibrant Patong Beach. The typical Busakorn Studio feature traditional Thai-style décor, with hand painted tile flooring and teak furniture. Probably the most exclusive accommodation is the Busakorn villa with a pool view. Each room is decorated with teak wood floor, wood furnishing, silk pillows and Thai artworks. The main highlight is the Bose iPod dock and sound system with pre-loaded iPod. The bathroom features a granite flooring. Villas’ guests enjoy private check-in the exclusive studios are furnished with a large wardrobe with laptop safe. There are complimentary fruit, cookies and newspapers. 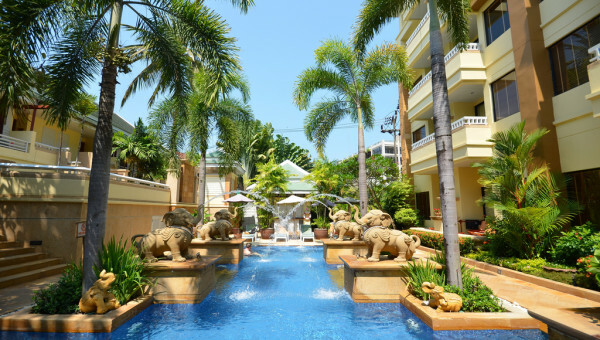 Holiday Inn Resort Phuket offers a warm Thai hospitality, comfort and friendly service. As soon as we arrived we got welcome drink. The breakfast offered in the main restaurant was excellent. We also tried the Sam’s steaks & grill. The restaurant was a popular spot not only for hotel’s guests but for other tourists in Patong beach.